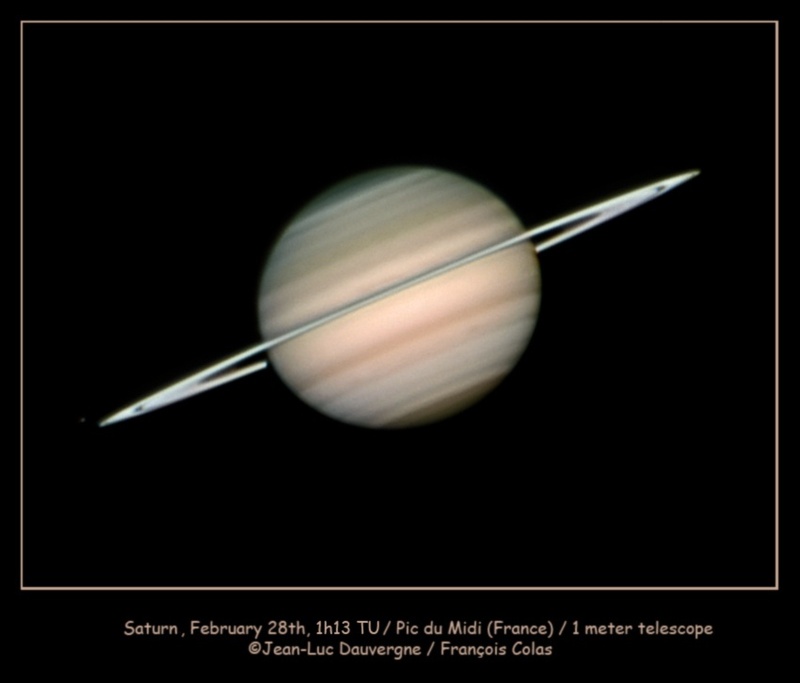 Explanation: Very good telescopic views of Saturn can be expected in the coming days as the ringed planet nears opposition on March 8th, its closest approach to Earth in 2009. Of course, opposition means opposite the Sun in planet Earth's sky - an arrangement that occurs almost yearly for Saturn. But while Saturn itself grows larger in telescopic images, Saturn's rings seem to be vanishing as their tilt to our line-of-sight decreases. In fact, the rings will be nearly invisible, edge-on from our perspective, by September 4. Recorded on February 28, this sharp image was made with the 1 meter telescope at Pic Du Midi, a mountain top observatory in the French Pyrenees. The rings are seen to be tilted nearly edge-on, but remarkable details are visible in the gas giant's cloud bands. The icy moon Tethys appears just beyond the rings at the lower left.